See the description of FlowBox. Marks child as changed, causing any state that depends on this to be updated. This affects sorting and filtering. Note that calls to this method must be in sync with the data used for the sorting and filtering functions. For instance, if the list is mirroring some external data set, and two children changed in the external data set when you call changed() on the first child, the sort function must only read the new data for the first of the two changed children, otherwise the resorting of the children will be wrong. This generally means that if you don’t fully control the data model, you have to duplicate the data that affects the sorting and filtering functions into the widgets themselves. Another alternative is to call invalidate_sort() on any model change, but that is more expensive. Gets the current index of the child in its Gtk::FlowBox container. The index of the child, or -1 if the child is not in a flow box. 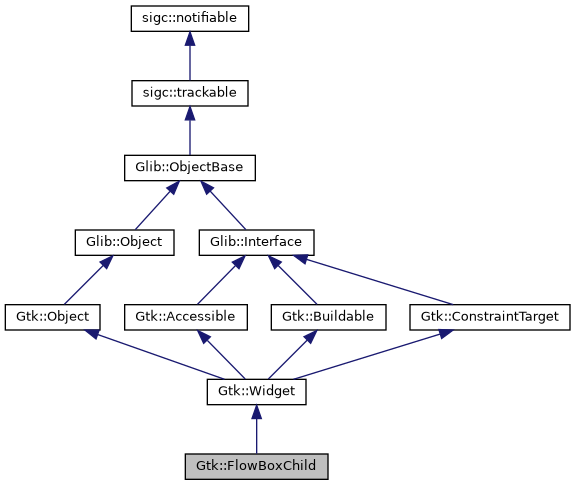 Returns whether the child is currently selected in its Gtk::FlowBox container. true if child is selected. The signal_activate() signal is emitted when the user activates a child widget in a Gtk::FlowBox, either by clicking or double-clicking, or by using the Space or Enter key.